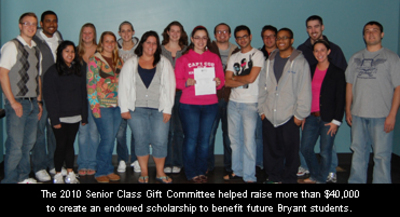 "Class of 2010 Gift -- Legacy Scholarship"
On February 8, the Class of 2010 unveiled their class gift – the Class of 2010 Legacy Scholarship that will support the educational endeavors of Bryant students for years to come. The gift was determined by a vote of the members of the senior class, and nearly half voted to support this scholarship fund. By May 2010, the Class of 2010 raised $41,000 with an all-time high participation rate of 55%. To commemorate this Senior Class gift achievement, Bryant President Ron Machtley and his wife Kati searched for an appropriate gift. They always hoped that Bryant University would have its own live bulldog mascot. So Ron and Kati purchased and donated to Bryant, in honor of the fantastic class of 2010, a most lovable, tenacious scholar, and wonderful mascot, Ironclad Tupper I -- an English bulldog, just 18 weeks old (May 2010) complete with Bryant school character and spirit. He joined Bryant from the Ironclad Kennels in Raynham, Massachusetts and is under the mascot love and tutelage of Bryant employees, Claire and Tina Senecal as he grows and trains for his new role. The Bryant community was introduced to the adorable Tupper I on Wednesday, May 19, 2010 in the Koffler Rotunda.